One of the impressive things about Science Fiction Digest was the quality of its printing. It was initially produced on a hand press purchased by its editor, Conrad H. Ruppert. At that time the only practical alternative for reproducing print was the mimeograph, which often produced unreadable results. The crisp and professional appearance created by Ruppert’s printing was likely an important factor in the notice that SFD received from the professional publishers. Ruppert’s contributions to sci-fi fandom were widely recognized by his peers, including a tribute in the November issue of the contemporary fanzine The Fantasy Fan (below). One nice thing about printing is that the typeset for typical pages can be reused from issue to issue. Most of the elements of the masthead for SFD remained the same each month. One thing that did need change, however, was the date. Unfortunately this didn’t happen with the November issue, which showed the date as October. On all of the copies I’ve seen the error was corrected by hand, most likely by Ruppert himself. If the page at left from The Fantasy Fan reminds you of the look of SFD, it’s not an accident – Ruppert printed this publication also. The Fantasy Fan was focused more on “weird” fiction and was not (at least initially) positioned as a rival to SFD. The ad at the right from the May,1933 issue will give some sense of what printing cost at the time. 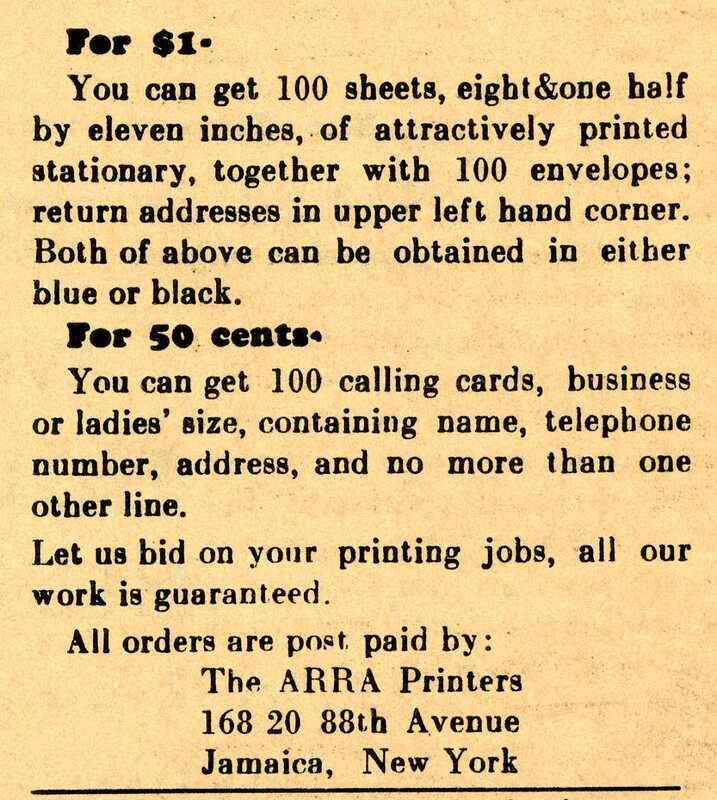 ARRA Printers was Ruppert’s company, so SFD was an advertising channel as well. A one-year subscription to SFD cost $1, the same as 100 sheets of pre-printed stationary. Given the number of pages and the variation introduced by the Cosmos inserts, the magazine was a bargain based just on its material costs. We had started by mimeographing The Time Traveler, but thanks to a fellow named Conrad H. Ruppert we were able to print some of the issues. 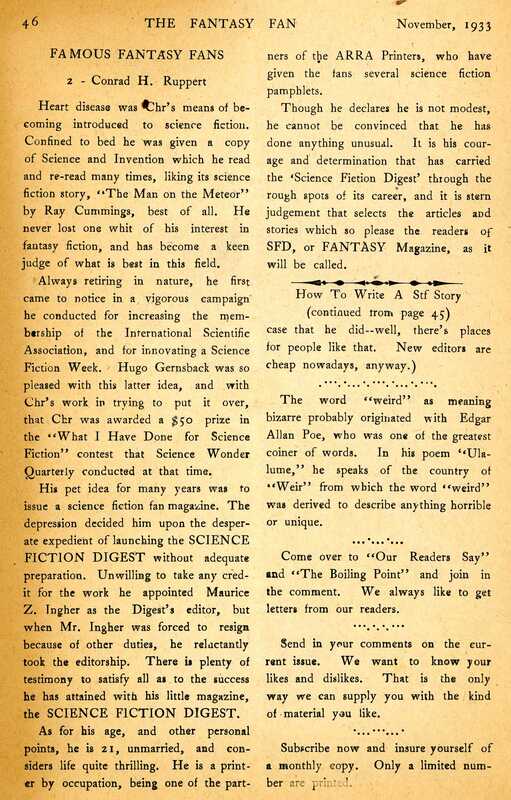 Ruppert offered to print our next magazine, which was called Science Fiction Digest. It sold for a dime, twelve issues for a dollar. A dime was a lot in those days. You could mail a letter for two cents and ride the subway for a nickel. You could have lunch for ten cents. The average person was making eight to ten dollars a week. …When our magazine was being printed it was done on separate pieces of paper, and Connie and I, and once in a while Mort, would collate and staple pages into issues. 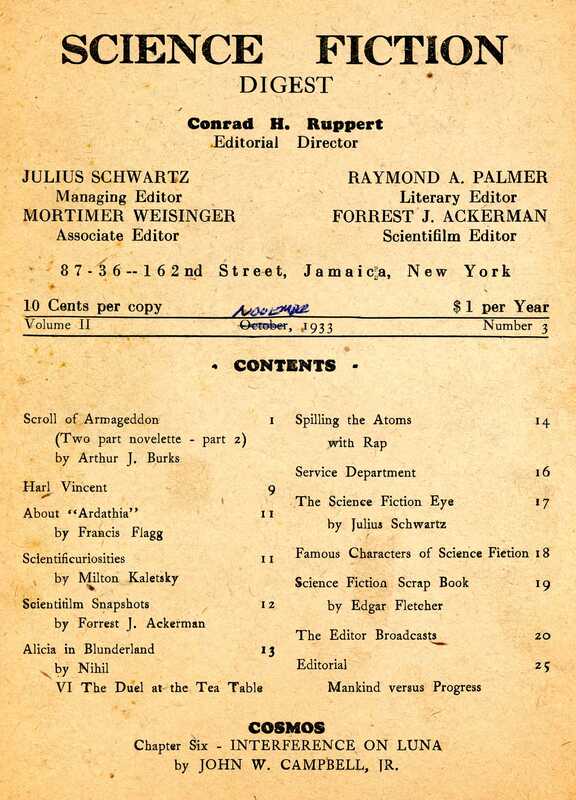 Each of the people who were involved at the start of Science Fiction Digest contributed twenty-five dollars to begin producing and mailing the magazine. The letters column this month sported a new masthead, with more art by Clay Ferguson, Jr.
COSMOS is good. We all agree on that. The editors may have lacked paper, money and experience, but enthusiasm was in ample supply. Read Chapter Six of Cosmos. Read about the December, 1933 issue.